You can buy eyeglasses from online retailers that don’t require an eye care provider’s prescription certification. The EyeGlass Numbers (EGNs) that are generated by EyeQue at-home refraction error tests – EyeQue VisionCheck or EyeQue Personal Vision Tracker (PVT) are the same measurements that make up a traditional eyeglass prescription to correct nearsightedness, farsightedness, and astigmatism. Since the test is self-administered (not performed by a doctor), the results are not prescriptions. However, you can use the EGNs to order eyeglasses online. We’ve even listed some of our favorite retailers below. Using your smartphone and either the VisionCheck or PVT, you can obtain the numbers you need to buy those new eyeglasses without leaving the house. You can compare the results with your last prescription to see if it is still accurate or if your vision has changed since your last visited the eye doctor. With the amazing selection, cost savings, and convenience of buying online, why not test your vision from home and get yourself the most up-to-date set of glasses? Test your vision from the comfort of home and use the results to order glasses online. More than 15,000 people are actively taking vision tests in their own homes with EyeQue products. In a recent survey, almost 90 percent of people who purchased eyeglasses online using their EyeGlass Numbers said their new glasses worked just as well, or better, than their previous prescription glasses. See what our customers have to say on our testimonial page. By testing your vision at home, you can proactively monitor changes in your refractive error over time and automatically save and retrieve them from your EyeQue mobile app or online dashboard. If you notice significant changes, it’s important to make an appointment with your eye doctor for a comprehensive eye exam. An optometrist or ophthalmologist will check for potential eye diseases that may be contributing to major refractive changes. Before you start browsing online, you’ll need two sets of numbers – your new EyeGlass Numbers and your Pupillary Distance (PD) measurement. PD is a measurement that’s often left off of your issued prescription, yet without an accurate PD, your new glasses won’t do their job. PD is the distance measured in millimeters between the centers of the pupils – most adults have a PD between 54mm to 74mm. This is important because it delineates the optical center of each eyeglass lens. If the PD is wrong (out of tolerance), a person will not be able to accurately focus both of their eyes together, resulting in blurry vision or headaches. But fear not! We’ve got two ways to collect your PD. 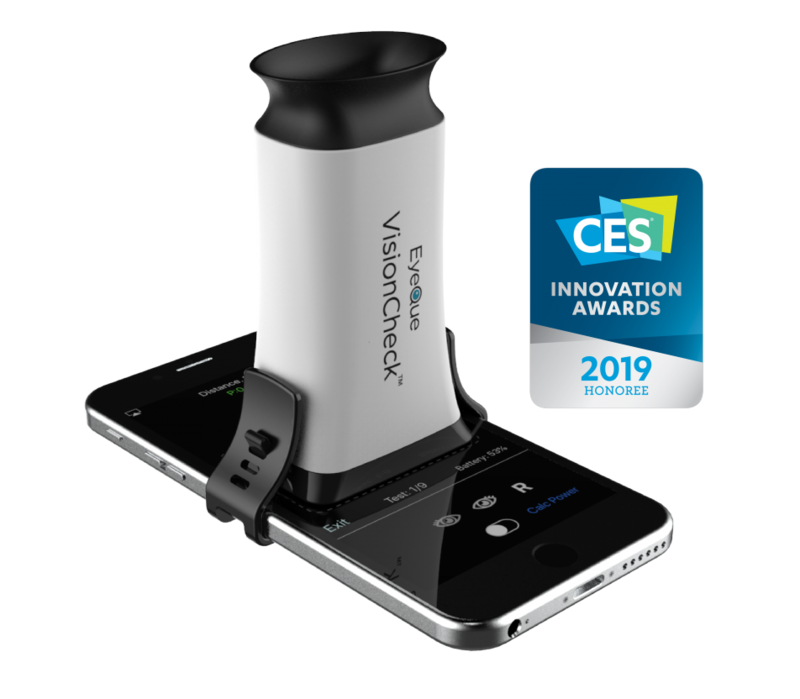 The EyeQue PDCheck is a set of patent-pending frames and a smartphone app that accurately captures your pupillary distance instantly and is as easy as taking a selfie. It is extremely accurate: our patented frames create a stable reference point and image processingcan determine your PD to an accuracy of +/-1 mm. It is convenient: there is no need to print a paper ruler or hold a credit card against your head or pay another visit to the eye doctor. All you have to do is take a selfie or have a friend snap a picture of you. PDCheck is included with a purchase of VisionCheck or you can pick one up on its own. Learn more about PDCheck here. 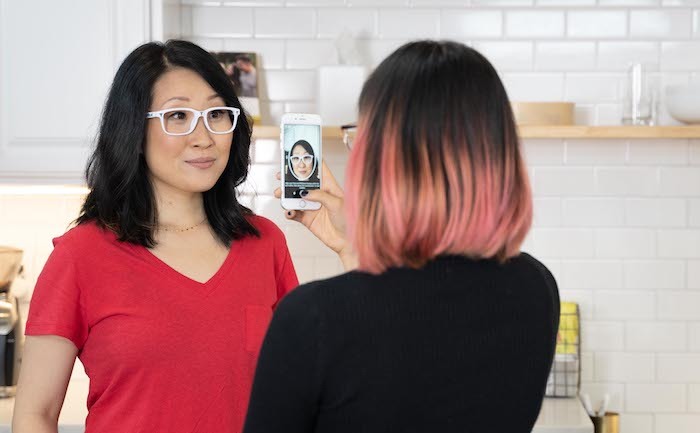 Wearing the PDCheck frames, you can take a selfie or have a friend snap the photo. Another way to measure PD is with a ruler. Personal Vision Tracker orders placed in the EyeQue store receive a PD ruler, which is also super easy to use. Who doesn’t want to save time and money? With EyeQue you’re able to test your vision from home while updating your EGNs before placing a new glasses order. There are several online retailers that offer extensive frame selections and phenomenal prices. Here are a few online retailers to check out! Using state-of-the-art optical materials and the most up-to-date manufacturing process, Zenni Optical eyeglasses are custom made and come directly from their factory to customers. With no middleman and no retail-space overhead, Zenni Optical provides high-quality glasses at affordable prices for everyone. While traveling abroad, Eye Buy Direct founder Roy Hessel observed that many people did not have access to obtaining the perfect vision. “I founded the company on the belief that quality eyewear should be accessible, and more importantly affordable, to everyone. The ability to see shouldn’t be held at a premium when it’s such an integral part of our daily lives.” To facilitate the process, the company has posted a guide to buying their prescription eyeglasses online. Since opening its first lab in 2008, GlassesUSA has manufactured millions of lenses, ranging from single vision to complex ultra-thin lenses for high refractive errors. Today, its dedicated team of optical experts, craftsmen and production workers work in a 7,500 square foot state-of-the-art lab equipped with some of the most modern optic equipment in the industry. The company runs frequent promotions and sales. They also offer an easy-to-use “try it on” tool in which you can upload a photo of yourself to see how frames look. Unless your prescription is above +/- 3.00, professionals recommend skipping add-ons such as antireflective coating, high index or ultrahigh index lenses. Some online optical retailers accept vision insurance, so investigate this before ordering. If you have a flexible spending account or health savings account, take advantage of this pretax money to pay for prescription glasses and contact lenses. Test your vision, measure your pupillary distance, and order glasses online with your results.